I do not know what I may appear to the world; but to myself I seem to have been only like a boy playing on the seashore, and diverting myself in now and then finding a smoother pebble or a prettier shell than ordinary, whilst the great ocean of truth lay undiscovered before me. A man with no home and no job, Paul Erdös was the most prolific mathematician who ever lived. Born in Hungary in 1913, Erdös wrote and co-authored over 1,500 papers and pioneered several fields in theoretical mathematics. At the age of 83 he still spent most of his time on the road, going from math meeting to math meeting, continually working on problems. He died on September 20, 1996 while attending such a meeting in Warsaw, Poland. 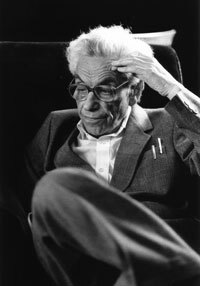 N is a Number: A Portrait of Paul Erdös was filmed between 1988 and 1991. The film opens at Cambridge University's 1991 honorary doctorate ceremony, where Erdös received an award he says he would gladly trade for a "nice new proof." For Erdös, the meaning of life is "to prove and conjecture." In an age dominated by technical wizardry and high tech communications, Erdös was an unusual human link connecting hundreds of people. As he traveled from country to country, Erdös carried with him the latest in mathematical thinking, inspiring others to develop new ideas and, sometimes, entire new fields. In turn, the mathematical community supported this repository of centuries of mathematical knowledge and lore. Every mathematician in the world has an "Erdös Number"-the number of people he or she is removed from having co-authored a paper with Erdös. To pursue this life of wandering and pure scholarship, Erdös relied on a network of other renowned mathematicians-all of whom regarded him as an international treasure. Wherever he touched down, whether in Hungary, Australia or Kalamazoo, Erdös immediately began working on problems with his colleagues. They, in turn, took care of his everyday needs. Ronald Graham, director of the Mathematical Sciences Research Center at AT&T Laboratories, keeps an "Erdös Room" at his home in New Jersey. From here, Graham managed Erdös's financial affairs and coordinated his travels and lectures, trying to maintain a semblance of order in the life of a man who kept no bank accounts and gave money to anyone he felt needed it. In Cambridge, England, Béla Bollobás, an ex-Erdös student, provided another oasis. As the film progresses it becomes clear that mathematicians around the world had more than a professional stake in caring for Erdös. In different ways, each of the many prominent mathematicians in the film expresses dedication to and love for Erdös. The structure of N is a Number is based on Erdös's 50 years of perpetual wandering, "like a bumblebee," carrying news and mathematical information from university to university. Erdös established himself as a serious mathematician at the age of 20 when he devised a more elegant proof for Chebyshev's theorem, i.e., that there is always a prime number between any number and its double. He was at the center of an informal clique of gifted young mathematicians in Hungary, known as the Anonymous Group, because they would meet in a Budapest park under the statue of a medieval historian named Anonymous.